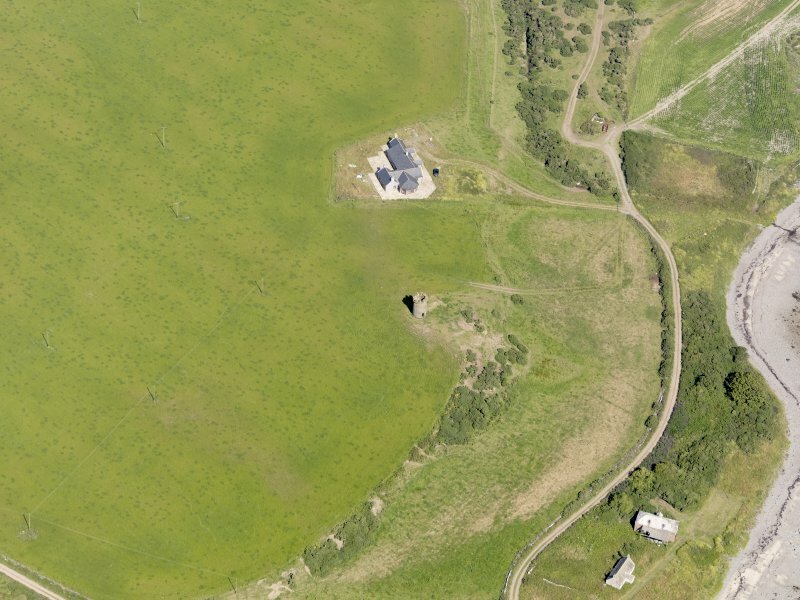 Oblique aerial view of Logan Windmill, taken from the S.
Oblique aerial view of Logan Windmill, taken from the ESE. 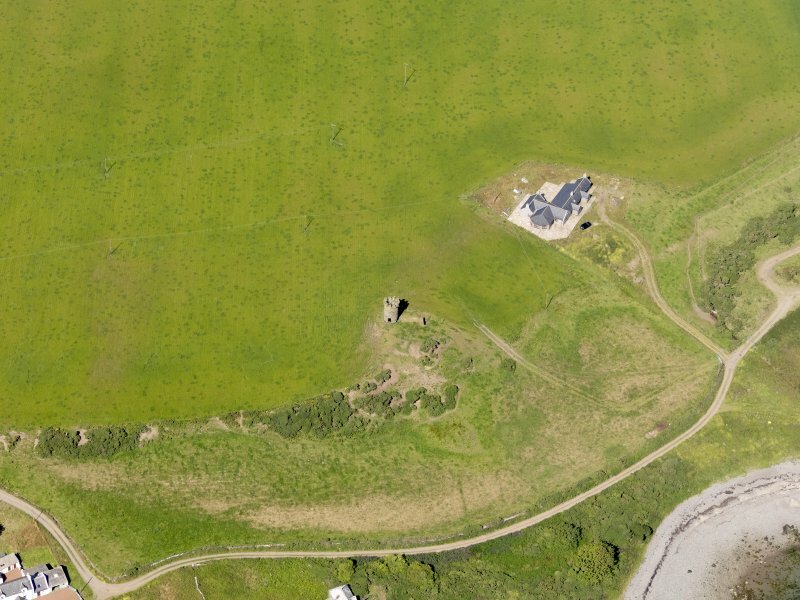 Oblique aerial view of Logan Windmill, taken from the NE. 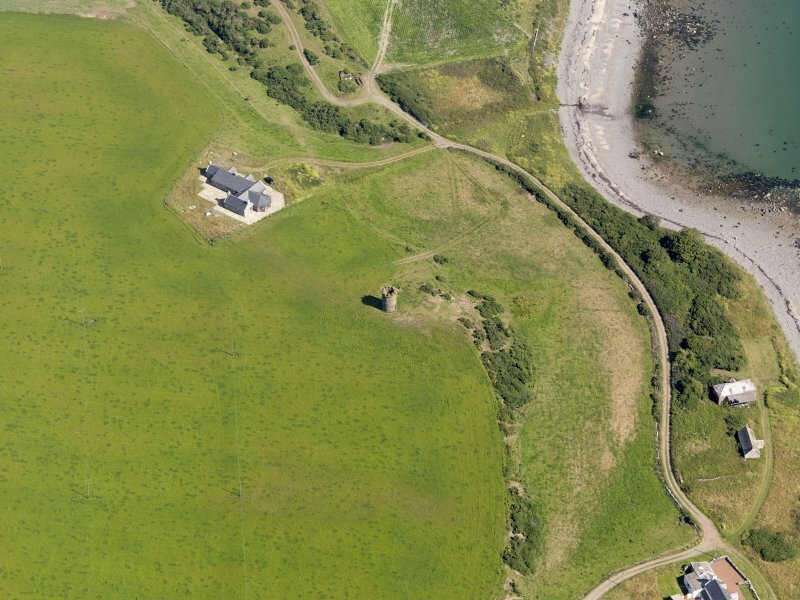 Oblique aerial view of Logan Windmill, taken from the SE. View from NE. Copy of 35 mm colour transparency. For (successor) Logan Mill (NX 116 436), see NX14SW 17. Logan Windmill is a fine example of a vaulted tower windmill, which was built in the late 17th century, and is mentioned c. 1684. 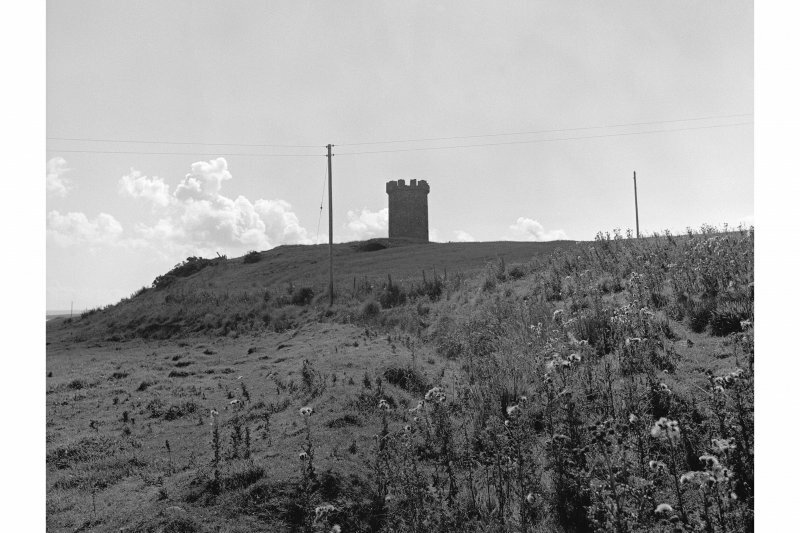 The tower situated on a natural mound, is about 25' (7.6m) high, internal diameter 10' (3m), on walls 3' (0.9m) thick. The doorway at ground level is 7' (2.1m) by 3' (0.9m). The vaulted chamber on the N side extends 30' (9.1m) from the base of the tower, and is 8' (2.4m) high by 11' (3.4m) wide. The whole structure is strongly built of whinstone rubble and boulders from the beach. As described; the crenellated top is modern. Visited by OS (DWR) 25 January 1972. (Location cited as NX 116 438). 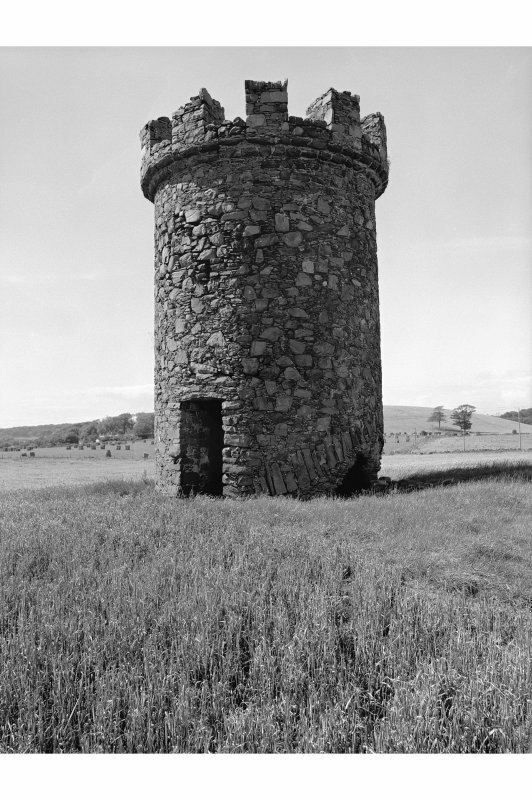 Logan Windmill, late 17th century. 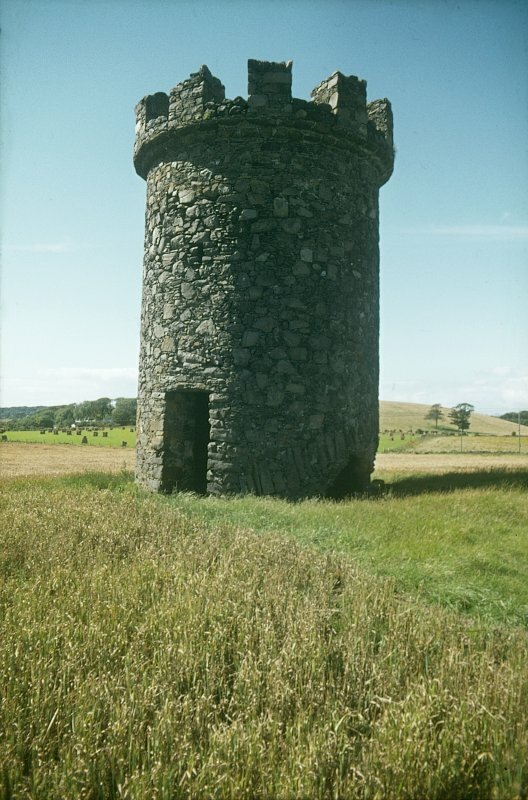 An interesting example of a vaulted-tower mill with a circular rubble tower, now crenellated, and a vaulted chamber projecting to the north. A relieving arch is built into the tower above the vault, which has collapsed at the junction. 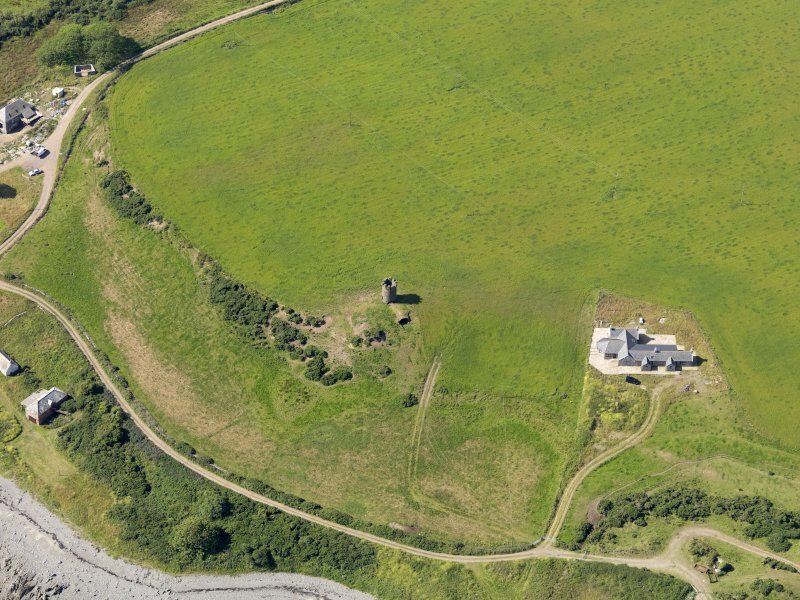 This vaulted windmill, which stands on a low rise on the degraded cliffline 150m NNW of Logan Mills farmhouse has been reduced to a shell. Built shortly before 1684, it comprises a basement and two storeys to which a crenellated parapet has subsequently been added. The tower measures 7.9m in height and 2.8m in diameter within a wall 1.1m in thickness. Doorways are set at ground level, and on the N the basement opens into a barrel-vaulted chamber measuring 9.2m in length by 3.4m in breadth. W Macfarlane 1906-8; I Donnachie 1971; G Douglas, M Oglethorpe and J R Hume 1984; RCAHMS 1985, visited July 1984. Windmill. Vaulted tower type. 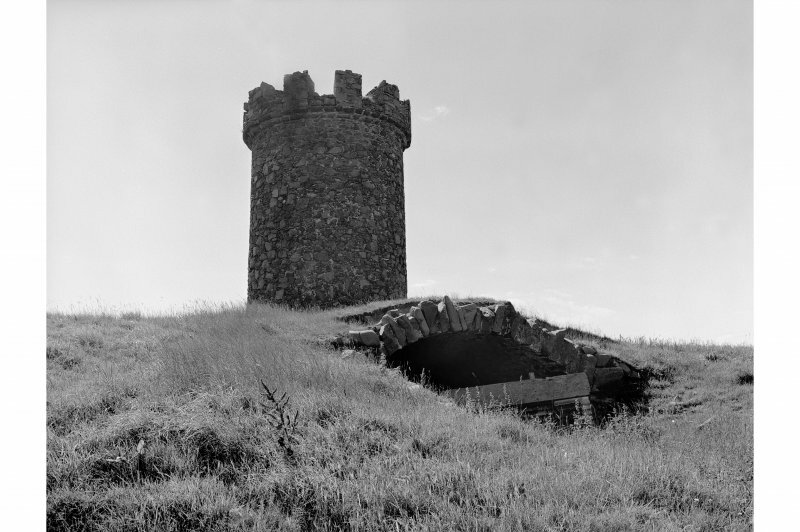 Circular tower. Rubble. Corbelled crenellated parapet with rubble merlons, added later. Doorway to E and W, partly blocked to W. Barrel vault to N, extending from basement of tower. Broad relieving arch to tower above vault, with remains of red brick (hand made) arch below. 2 rows of floor beam sockets inside.